Hydrafacial skin rejuvenation system which is the first choice of Hollywood stars is preferred by women who want a shiny and clear skin. Hydrafacial was selected as the best skin care and rejuvenation system by American Association of Esthetic for 3 sequential years. 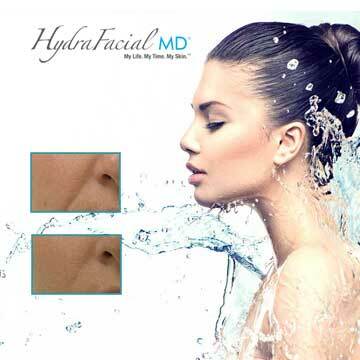 Hydrafacial applications are quite comfortable and effective. It is applied just before the invitations by many famous stars like Paris Hilton, Demi Moore as it does not lead to irritation, burn or other adverse events. The system works with a unique method which is defined s hydradermabrasion and based on applying sera absorbed from skin with pressure, over-cleaning of the skin and applying vitamin and required substances to skin through special probes together with extremely effective peeling. Hydradermabrasion is the first method which combines cleaning, skimming, renewing, humidifying, antioxidant protection procedures. Fluid dermabrasion technology which enables to reach a more shiny, beautiful and young skin. It is proper for every skin type, yields excellent outcomes for wrinkles, spots, comedons, large pores, fatty skin and acne treatment..
Hydrafacial MD uses personal sterile probes which prepares personal solution and transfers it into deep skin with high pressure. Special vortex system completely skims dead tissue and rejuvenates skin, eliminates wrinkles through the substances transferred to skin. Improved image quality through HD technology in televisions has led to high quality in skin appearance. Edge, USA has developed Hydradermabrasion technology and HD skin treatment. Hollywood stars who use this technology come in the foreground with their skin appearance, you should meet this technology, too.